A cornerstone of the Boy Scout programs is training. There are many opportunities available to youth at various levels to further develop. Some of these trainings will be conducted at the unit level; some will be conducted at District and Council levels; and, others are available to work on individually during self-study. 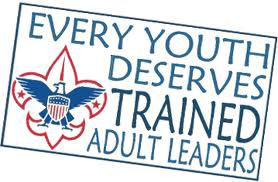 Making sure adult scouting training records are accurate and up-to-date is a very important step to insure quality program is being delivered to the youth involved in Scouting. When is the last time you have looked at your individual Scouter profile? In the coming months, Nevada Area Council will be embarking on a training initiative called “ALT” (All Leaders Trained). One of the things other Councils have discovered while taking the first step to complet a training inventory is that records are not current or accurate. We are asking that all registered Scouters look at their individual profile and correct any omissions and errors in training records prior to August 1, 2014. It will certainly improve our Council's JTE numbers, and, more importantly, it helps us develop a successful strategy to get all leaders trained going forward. The really good news in this endeavor is the “Key 3” at all levels of leadership now have access to their units' individual training records and can review and change these records for everyone in their units but themselves. At the unit level, that means Committee Chairs, Scoutmasters, and Organizational Reps now have the ability to do this. It is not necessary to go to Council to make your unit's training records accurately reflect what has been completed. It is extremely important that each unit make sure their training records reflect the actual current training status of every registered Scouter. This decision to push this step down to the unit level is key to moving forward with “ALT.” So let’s not waste another day and get this done. Access to these records can be attained through myScouting Tools.